Did Andy Warhol Sign You Or Your Baby? Andy Warhol was definitely in the famous for being famous phase of his career when he published his memoir, Popism: The Warhol Sixties in 1980. 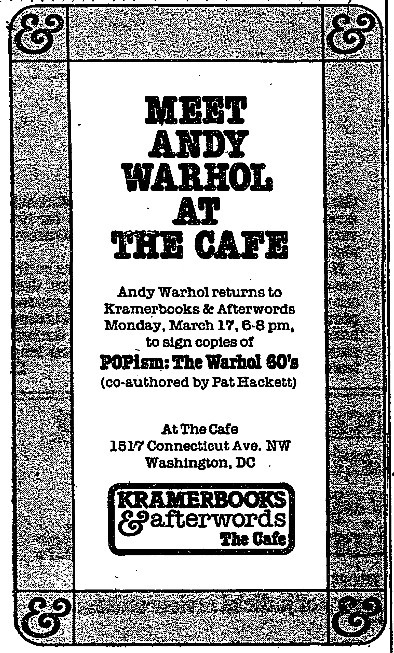 Popism was based on audio tapes Warhol recorded during the 60s and co-written with Pat Hackett who, of course, was also recording reports Andy made to her on the phone each morning to document the previous day's activities and expenses. After the artist's unexpected death in 1987, Hackett published these as The Warhol Diaries. And they are indispensably awesome. Well, it was St. Paddy's day. Bob [Colacello, Interview magazine editor] ordered breakfast up. I didn't have a good sleep. We watched the Match Game and it was a fast round where the answer was "Andy Warhol" and one person was guessing "Peter Max" and then "Soup Can" and then "Pop Artist." A girl came and took us to Kramerbooks, it's a bookshop coffee house, and so everybody was drinking. Bob loves the place because it's where he picked kids up when he was at Georgetown. People were shoving everything at me to sign and I signed it all--underwear, a knife. Oh, (laughs) and I signed a baby. So you see why I've called you all here. We must find this baby, and the overachieving DC parent who got it signed by Andy Warhol. At a drunken Dupont Circle book party on St Patrick's Day.